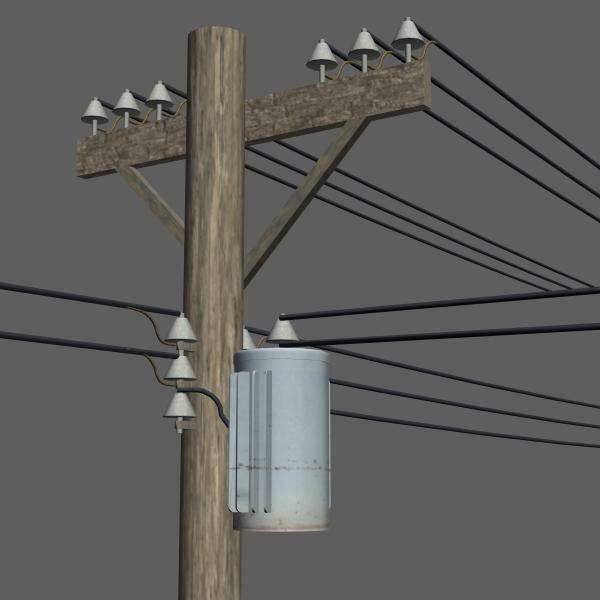 This add-on set features a series of Telephone Poles. These segments can be duplicated and added into your scene to create any combination of street system you like. There are six (6) parts to this Street Construction Set Add On. PC users and Poser users should (hopefully) have no difficulties with the .pp2 Poser files or the texture JPEG files, as far as I know, however they have not been tested on those platforms or software. OBJ files are also included. If you would like other modules in this series, please look at my ShareCG Gallery. perhaps it is related to 4.6.2 version of DS. Ok! That info helps. I'm also running DAZ 4.6, on a Mac. I can replicate some of the issues you are having. Using the .pp2 files brings all the elements in at "Poser" scale (1 unit = 8 ft.) as intended. Importing the raw OBJ files, you can choose the unit parameter. Selecting "DAZ Studio" gives you 1 unit = 1 cm. Rather small. "Poser" scaling brings the raw OBJ file in at the same scale as the .pp2, for me. The oddity is that all the elements I open, or import, into DAZ are at the same scale relative to each other. I can't seem to replicate the issue you are describing where one element appears at one scale while another appears at a different scale. It's vexing. Hm. That seems odd. All the OBJ files were created at the same time and scale using Hexagon. There might be some scaling issues by loading the OBJ files directly, or a more recent version of Poser (8 and up) might be translating the older .pp2 files in an odd way. Let me know what version you are using and I'll try to track down the issue. Meanwhile, my gallery has an update for the Telephone Poles for use with the 3-way T Intersection. Download and try that, too, as it might help. You are all very welcome. Thanks for downloading! I hope they help with your scenes. Thanks for this, and all the other parts as well. Semicharm (6 years ago) Inappropriate? Now that's something I've rarely seen models for. A must have for street scenes. Thanks!